Wick tails should use as little material as possible. You want the wick to channel juice to the coil, not act as a reservoir for juice. Juice should be able to flow freely from the juice well to the coil. Some methods recommend you stuff extra wicking material to the side somewhere, to act as a reservoir. Depending on the size of your coil, the amount of wicking material and how much juice is vaporized, this might help. But generally, you will not be able to store much juice there anyway. Rather make sure juice can flow freely from the juice well to the coil. Tails should be as short as possible. 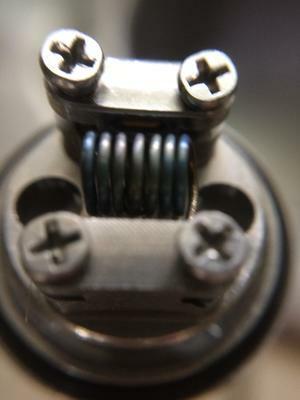 The shorter the path to the coils the faster juice will get to the coil. The wicking material should be packed tight enough inside the coil to maximize contact with the coil. If the wicking material is too loose, juice won't be able to flow and get in contact with the coil fast enough for the juice to be vaporized. If the wicking material is too tight, there will not be enough space around the wicking material fibers to channel the juice to the coil. You want the wicking material to fit snugly inside the coil. 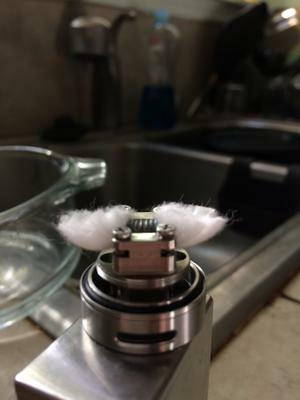 If it's too tight, you will deform your coil when wicking. 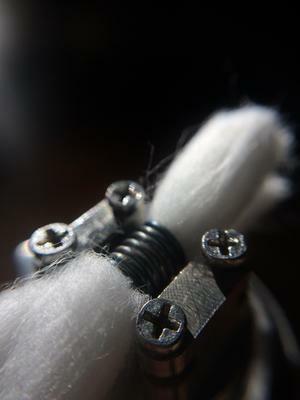 Too loose, and the wicking material will move around inside the coil. Cotton will generally expand a little when it gets saturated by liquid, while synthetic fibers like Rayon will expand less or even shrink. 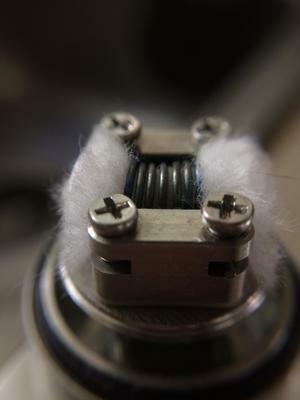 Synthetic fibers should therefore fit a little tighter than cotton before you prime your coil with juice. 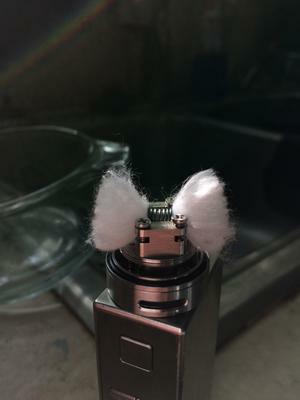 Wick your coil and fluff the tails to ensure there is space around the fibers for the juice to flow. Fold them up, away from the wicking holes for easy access to trim with scissors. Cut the wick tails in a line close to the top of the coil. The curve of the wicks will naturally ensure that fibers are cut longer on the outside/bottom of the coil and fibers are shorter at the inside/top of the coil. You can use curved scissors if you like, the shape of the final trimmed wick needed will depend on the thickness of your wicking material and the size of the wicking channel holes. 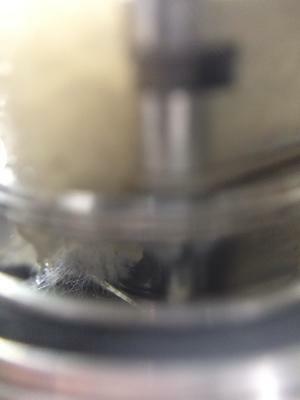 The fibers at the outside/bottom should be long enough to go through the wicking channels and just touch the bottom of the juice well. Fold the tails down, through the wicking channels. Ensure the wick fills the channel holes completely to prevent leaking. This method ensures that you do not pack the wicking channels too tightly, while still having enough material in contact with the coil. Care should be taken not to leave any substantial gaps in the channels to prevent leaking. As long as there is some wicking material filling the channel, it should not leak. Because there is as little wicking material as possible going through the wicking channels, it's ok for the tails to go all the way to the bottom of the tank. This ensures that juice can flow until the tank is almost empty. 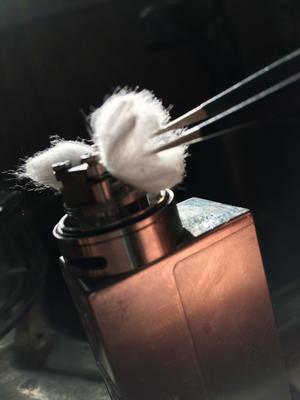 The longest tail end of the wick goes through the wicking channels to the bottom of the tank and is saturated by juice from the tank, to ensure juice can flow through the channels to the coil from the bottom of the juice well. The shorter strands are not parallel with the tails, thus ensuring the wick cannot be packed too tightly through the channel holes. The shorter strands of the wick are still covering the channels to prevent flooding. The shorter strands of the wick are loose enough to ensure air can escape through the channels, into the tank, to lessen negative pressure in the tank and ensure juice can flow freely to the coil. 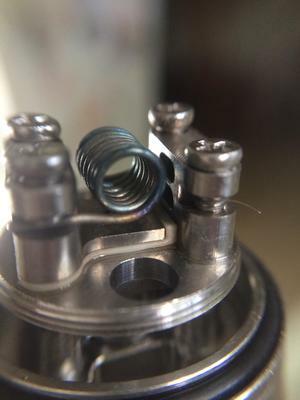 The pictures illustrate this method for the Wotofo Serpent SMM, but it can be applied to any atomizer that has wicking holes or channels going to the bottom of the atomizer tank. It works for RDA's as well.